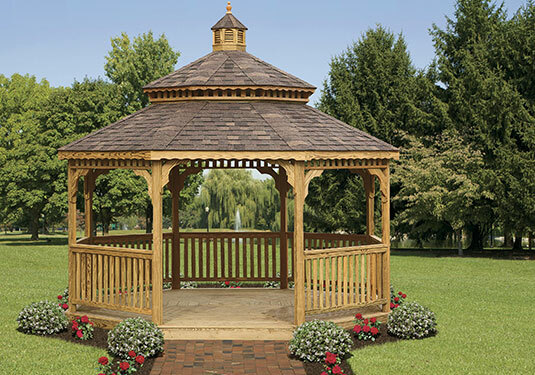 Fully embrace the classic look and feel of wood gazebos from Pleasant View Structures. Our wood gazebos are pressure treated to provide added protection from the elements. Each structure is also expertly crafted with high-quality #1 southern yellow pine, a species of wood known for its durability and strength. The wood used for our gazebos is kiln-dried twice and milled on four sides. This extra attention to detail reduces shrinking and creates a smooth, even finish. 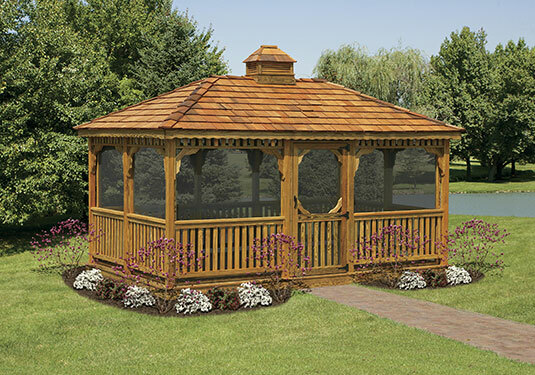 We also offer cedar gazebos that are crafted just as meticulously as our pressure treated models. The difference is that our cedar gazebos are made with architectural grade western red cedar. Cedar, in general, is a species of wood widely known for its longevity, resistance to decay, and natural beauty. 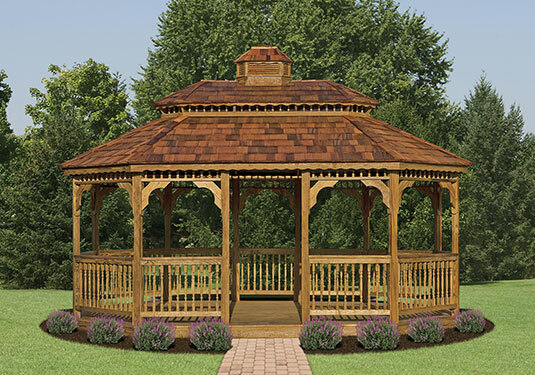 Our wood gazebos come in styles that range from cozier oval designs with cedar shingles combined with wood railings and posts to more intricate designs with vinyl four-track window systems, asphalt shingles, and Forester rails. Additional options include deluxe rails and screens and metal roofing. Contact us today to learn more about the wide selection of wooden gazebos available from Pleasant View Structures.